Rian James was the last of three directors assigned to The Best of Enemies; this sort of unnecessary expenditure was one of the reasons that the Fox Studios was always on the brink of bankruptcy. The plot is basic Hatfield/McCoy stuff, with Buddy Rogers and Marian Nixon playing the grown children of feuding German-Americans Frank Morgan and Joseph Cawthorn. Romance blossoms between Rogers and Nixon, while Morgan and Cawthorn continue muttering Teutonic imprecations at one another. 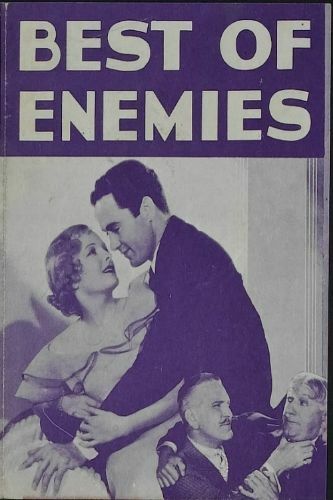 The Best of Enemies bears a striking resemblance to the tried-and-true stage play Friendly Enemies. Perhaps Fox could not come to financial terms with Friendly Enemies authors Samuel Shipman and Aaron Hoffman, so the studio churned out its own variation.